In many places in the US and particularly in the North-East stand vacant or underutilized mill buildings and other industrial structures as remnants from an abandoned industrial past. Although many have been successfully converted to new uses (e.g. housing, arts studios, retail, museums etc. ), quite a few stand vacant – a condition that is usually exacerbated by neglect from owners and/or municipalities, which can lead to accelerated deterioration and may render these objects too costly for any re-use. 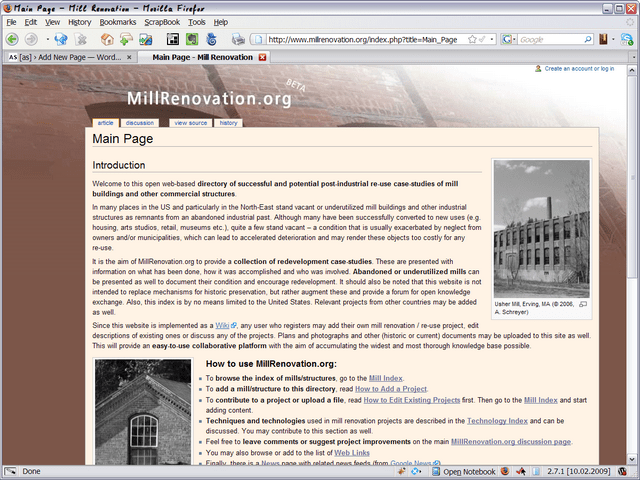 It is the aim of MillRenovation.org to provide a collection of redevelopment case-studies. These are presented with information on what has been done, how it was accomplished and who was involved. Abandoned or underutilized mills can be presented as well to document their condition and encourage redevelopment. It should also be noted that this website is not intended to replace mechanisms for historic preservation, but rather augment these and provide a forum for open knowledge exchange. Also, this index is by no means limited to the United States. Relevant projects from other countries may be added as well. Since the website is implemented as a Wiki, any user who registers may add their own mill renovation / re-use project, edit descriptions of existing ones or discuss any of the projects. Plans and photographs and other (historic or current) documents may be uploaded to this site as well. This will provide an easy-to-use collaborative platform with the aim of accumulating the widest and most thorough knowledge base possible. This site is currently in the beta-testing stage. Comments are welcome.